In March, two months ago. I have watched an Indonesian movie in the cinema. That was my first time i went to a cinema. OK, so the movie that i have watched was The Raid: Redemption, it's a action movie about polices who can fight with Silat martial arts style in a slum building. This is great martial arts movie, i was impressed with the martial arts fighting, because Silat is martial arts originally comes from Indonesia. I can say The Raid:Redemption movie is different than other action movies. Its combined between fast-thrilled action and deadly martial arts, you can get these two by watching the movie. 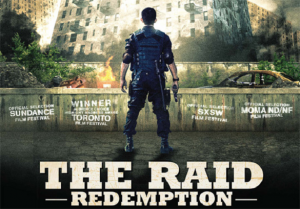 The Raid:Redemption in simply plot tells about some policemen ambushed a slum building in the red-zone from fictional place in Jakarta city. The polices were trapped inside the building which filled many criminals inside, the big boss would give prizes anyone who could defeat the polices. Would the polices survive inside the building? If you like to watch martial-art movie, maybe you would love this movie. I said the martial art seems different than others, you would see any gruesome movements and deadly techniques of silat fighting. Forget about simple plot in this movie, the point is not the plot, but in the action. You would get impressed by brutal fighting, thrilling-scenes, and bloody bodies because the silat martial art. This movie is not for children, not recommended to anyone who has heart-disease, because its very thrilling and amazing. Plus: Great martial arts i ever watched in my first time in cinema. Minus: Nothing, except you just comparing with successful Hollywood movies, because this move made in Indonesia. [Blog] How Old is Your Blog?